Lawmakers reached a compromise on Title X provisions in the state’s mainline budget March 28, amending and advancing the bill to final reading. LB944, introduced by Speaker Jim Scheer at the request of the governor, contains recommendations for state operations and state aid to schools and agencies. Lawmakers engaged in extended debate during several rounds of discussion on both general and select file on a provision in the bill regarding Title X funding disbursement to health clinics that also provide abortion services. Nebraska receives funds from the federal Title X program that are used to subsidize preventive and reproductive health services, including the diagnosis and treatment of sexually transmitted diseases, cancer screenings and family planning services. Federal grant funds dispersed by the state through the program cannot be used to perform abortions. A provision included in LB944 as part of Gov. Pete Ricketts’ mid-biennium budget proposal would prohibit federal Title X funds from being paid or granted to an organization that performs, assists, provides counseling in favor of or refers for abortion services. An otherwise qualified organization that is affiliated with, but objectively independent from, such an organization—which the bill defines as legal, physical and financial separation—would not be disqualified from receiving funds under the bill. Supporters said the provision is needed in light of questions raised by state audits to ensure that Title X funds are not “comingled” with funds used to provide abortion services. Opponents said the restrictive referral language would jeopardize funding for the state’s federally qualified health centers and hinder access to health care. Scheer offered an amendment March 28 that he said represents the culmination of “hours and hours” of negotiation by senators on both sides of the divide. He said the agreement was fair and the result of perseverance and a desire to pass the Appropriations Committee’s budget adjustments. While the amendment continues to prohibit the referral of a patient to an abortion service, the definition of referral would be limited to the act of recommending a pregnant woman to doctors, clinics or other persons or entities for the purpose of obtaining an abortion. Neutral, factual, nondirective information about prenatal care and delivery, infant care, foster care, adoption and pregnancy termination in an emergency situation in accordance with state law would not constitute an abortion referral. Omaha Sen. Sara Howard, who was among the senators who negotiated the language, said the emergency exception comes from existing state law and was included to allow a physician to use his or her good-faith clinical judgement to ensure that a woman’s life and safety is guaranteed. 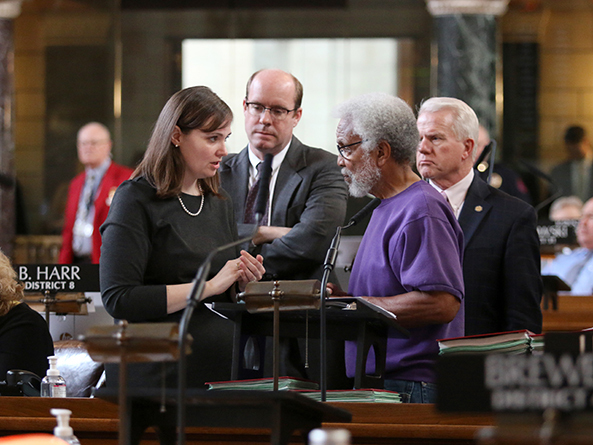 Lincoln Sen. Kate Bolz, vice chairperson of the Appropriations Committee, spoke in support of the amendment, saying its adoption would ensure funding for the state’s overall priorities through advancement of the budget. “This is a compromise that protects our state’s ability to continue to provide essential services through the Title X program, including cancer screenings, preventive health services and prenatal care,” she said. 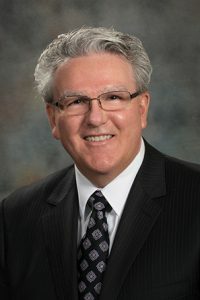 Sen. Mike Hilgers of Lincoln, who also participated in the negotiations, said the result was a compromise that would ensure Nebraska’s continued access to Title X funding. “This process put us in a room and did what I believe we should do here in this body: listen to each other, identify common goals that will help Nebraskans and work towards that goal. And where we could work together—without compromising our principles and beliefs—we did,” Hilgers said. Other senators said inclusion of the Title X language in the budget bill represented overreach by the executive branch into the Legislature. Sen. Patty Pansing Brooks of Lincoln said senators were rewarding inappropriate behavior from the governor by not removing an “incendiary” public policy issue from the budget process. She called the language a “hit job” on Planned Parenthood, which she said is the provider to nearly one in three Nebraskans who currently use Title X services. Lincoln Sen. Adam Morfeld said the language “almost certainly” would exclude Planned Parenthood from receiving Title X funding, which he said provides health care services to 8,000 to 10,000 Nebraskans. He said there is no assurance that another provider will be able to step in and serve those individuals. After two hours of discussion, senators voted 43-4 to invoke cloture, or cease debate and vote on the bill. The amendment was adopted on a vote of 40-4 and LB944 advanced to final reading 44-4. LB950, introduced by Business and Labor Committee chairperson Sen. Joni Albrecht of Thurston, which would provide for payment of claims against the state.